As educators I truly believe that we should always be growing. I’ve always found it funny that we’re one of the few professions, that when we graduate college, we think we’re done and ready to be the best teacher possible. Crazy right? I am constantly learning. I’m continually finding ways to better myself and be the best educator (and person) I can be. Sometimes though it’s hard to find the right avenues to continue your growth. Yes there’s social media platforms like Twitter and Instagram, but we all know that when we look for ideas there it can sometimes be like drinking out of a firehose. And sometimes, even though many people have the best intentions, their ideas need to be vetted more than we may be capable of or have the time to do. Then there’s those in person, face to face, opportunities to continue our learning. EdCamps are a fantastic place to go to, that is free, and connects you with other like-minded educators. As a teacher though, my district would often frown upon me being out of the classroom, even if I was trying to learn, grow, and better myself for my students. So where does that leave you? Where can you go if you really want some in-depth training or help in particular areas? Recently I’ve been introduced to an organization called Advancement Courses that I have fallen in love with. And what is even better about this organization, with over 200 courses, is that you can get CPE credit hours and graduate credit for the courses!! I am currently working through one called “Strategies for Addressing Student Anxiety” and wow! It truly is blowing my mind the amount of time and research that has gone into this course. It’s helping me dive into an area that I am passionate about learning more about. Because the courses are online, with up to 6 months to complete, it’s letting me do it on my time. It’s letting me go on my pace. That’s the kind of learning I need in my life right now. That kind of learning that is deep, grounded, and allows me to move at a pace conducive to my life. So, go check out some of their courses! It’s a pretty awesome spot. I’m looking forward to finishing up my first course and then joining another! If this is something you’re interested in, you can even use the code TODD20 at the checkout and get 20% off your first course! Check it out and let me know what you think? I’m dying to hear about other amazing courses from people like you who are using them! 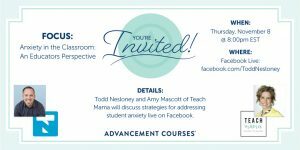 I’m also doing a Facebook LIVE on my Facebook page with Amy Mascott (TeachMama) on Thursday, November 8th at 7pm CST about this and the Student Anxiety Course! Come check it out!